Midwest's Premium Liquid Culture Kit saves you time and money on any larger growing project. Turn one spore syringe into 10 or more! Simply inject 5 cc's of your favorite spores in the culture jar and watch it transform into liquid mycelium. In a few days it will be ready to inject into any substrate jar or spawn bag. 4% Proprietary blend of Distilled water, Dextrose (Glucose), Extra Light Malt Extract & Peptone. Detailed instructions & tips for beginners and first time growers. Each jar can be used to inoculate up to 42 half pint substrate jars or 12 spawn bags! Our proprietary blend of sugars and fermented grain proteins provide the perfect liquid environment for mushroom spores to germinate and turn into liquid mycelium (the first stage of mushroom growing). Simply inject 5cc’s of your favorite spores into the jar, incubate at 80-85 degrees for 4-5 days and a white cloud of mycelium will start to form. Stir the jar using the included magnet and magnetic mixing bar to break up the mycelium. Insert the large 60cc syringe back into the jar and fill it up. Now you are ready to inoculate a large quantity of substrate jars or spawn bags! Once the jar is full of mycelium it can be stored in the fridge for up to 30 days and used as needed! When I got the product the package was all wet and I guess it spilled during transit. I emailed Midwest and told them what happened and they shipped me another one for free. I’m a very happy customer and will definitely do business again. This is my second lc order from Midwest and they never disappoint. If you're looking to expand your grow this is the way to go! This company wasn’t around years ago when I attempted this laborious process the first time. Since finding them, they have made my shroom growing dreams a reality. 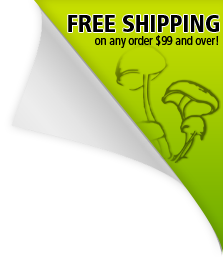 Thanks to their products, they make growing mushrooms pretty effortless once you have the knowledge down. These culture jars make my life a breeze, and you won’t regret buying any of their other products either - especially once you’re ready to go mono. This company was literally designed for people like me; aside from that, their customer service is sometimes hard to reach by phone (email seems to be better most times) but other than that they are spot on. Kudos to whoever is behind this operation. received quick and everything was there and nothing broken. Haven't got a chance to use it, but it came with instructions. Seems a little bit tricky with the magnet idea, but i like the thought. Looking forward to using it ASAP. Thanks again midwestgrowkits.